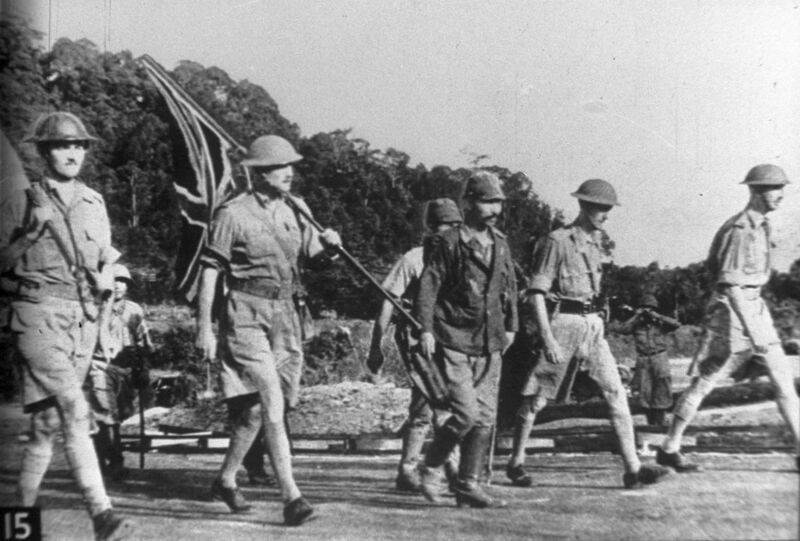 Almost 77 years since the commander of the Allied Forces defending Malaya and Singapore - Lieutenant-General Arthur Ernest Percival - surrendered Singapore to the Japanese, his son, retired brigadier James Percival, returned to the Battlebox on Monday. The former British underground command centre was where the momentous decision was made on Feb 15, 1942. Mr Percival, 81, was accompanied by his wife Ann, 75, as well as his daughter and son-in-law, on a personal visit to the historical site built in 1936 and located 9m under Fort Canning Hill. He was given a guided tour of the place by staff from Singapore History Consultants (SHC), a private heritage consultancy which manages the Battlebox, as well as its director Jeya Ayadurai. The 75-minute tour, titled The Battlebox Tour: A Story Of Strategy And Surrender, details the primary reasons for Malaya and Singapore's fall to the Japanese, as well as the roles and functions the various key rooms in the Battlebox played in the war. Mr Percival, who last visited the bunker more than 20 years ago, said: "My memory of (the underground bunker) was that you got the idea of being on the ground then, but it hadn't been developed nearly as much as it is now. "The portrayal of the campaign is infinitely better now than it was when I was here before. It's totally different. It's more comprehensive and I think it's a fairer assessment of what went on than it had been before." SHC took over the management of Battlebox in 2013. It was reopened in February 2016 after efforts to resolve maintenance and structural issues with the site. Mr Ayadurai said: "When we took on the task of reorganising the Battlebox, the intent was to be as impartial as possible and let history do the talking, and ensure that Singaporeans get a truer appreciation regarding the incidents that led to the fall of Singapore. "As a young country, we are now getting to appreciate that history, and to have General Percival's son come here on the tour and say that he felt that this was an impartial history - it was really good hearing that from him." The Percivals' visit to the underground bunker coincided with the Singapore Bicentennial, the 200th anniversary of Sir Stamford Raffles' landing in Singapore. Mr Percival said that upon hearing that he and his wife were coming back to Singapore, his daughter and her husband decided that they would join them. He said of his father, who died in 1966: "I've always been sad, throughout my life, that my father had to bear all the brunt of the surrender. When an event like this takes place, it's human nature that someone has got to be responsible for that. "It's easy to say that General Percival was responsible for the surrender of Malaya and Singapore. He wasn't. There were very many factors that led to the surrender of Singapore. And he was a scapegoat."